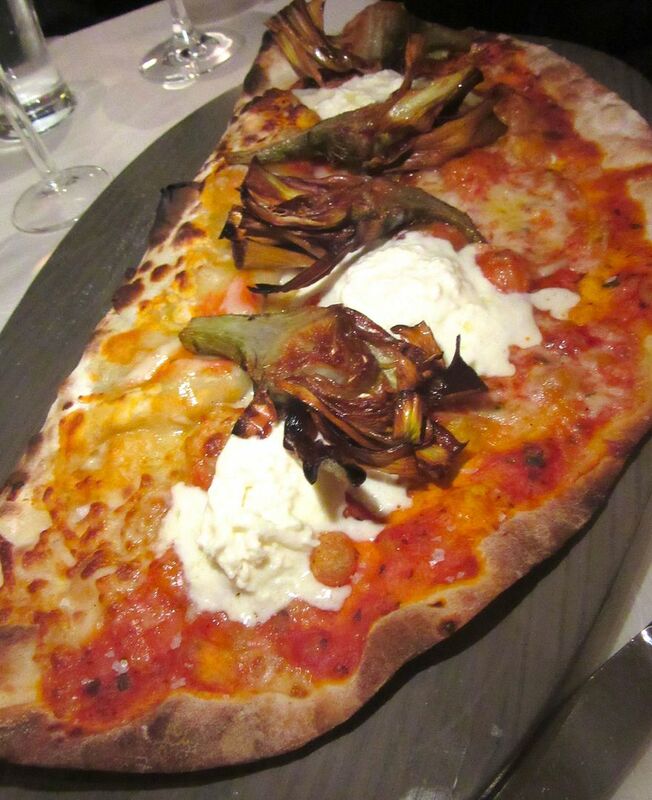 We ordered the artichoke calzone for a laugh but it’s very good, enough for 4 or 5. Caffé Florian in Venice’s Piazza San Marco dates from 1720, Italy’s oldest coffee house still dripping and foaming. Nothing much about Shelly Fireman’s sprawling new Florian: Café+Trattoria+Bar on Park Avenue South will make you think of Venice. Well, maybe the dashing cocktail-crafter Francesco with his “Bespoke Negroni” on custom ice cubes or his crisp Veneziana spritzer in an expensive, oversized goblet. Pietrasanta is a sculptor’s town. Looks like Shelly Fireman’s got the bug. The handsome tile floors made with Carrera marble from Pietrasanta, near where the Firemans have their hilltop Tuscan escape, may not be what catches your eye at first. 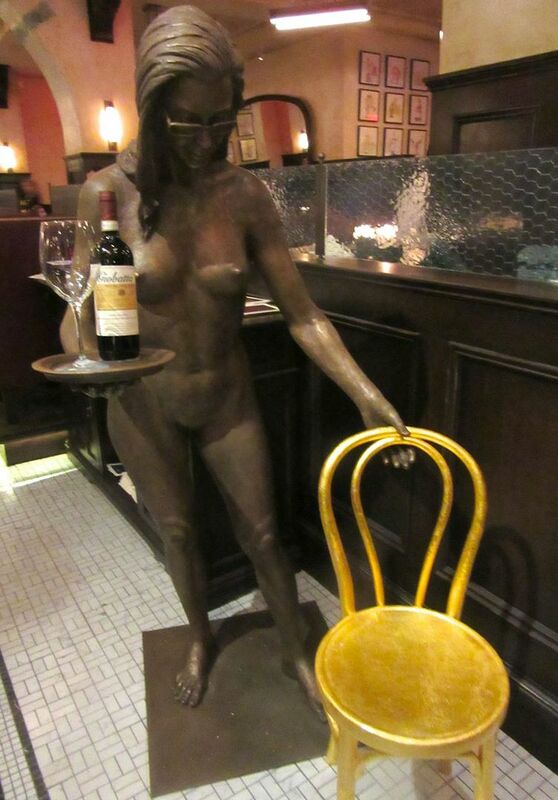 Step through the revolving door (“welcome home” says a sign) and most likely you’ll get stopped by the bronze sculpture just inside, a naked woman wearing sunglasses holding a gold-painted chair where you are invited to sit and take a selfie. 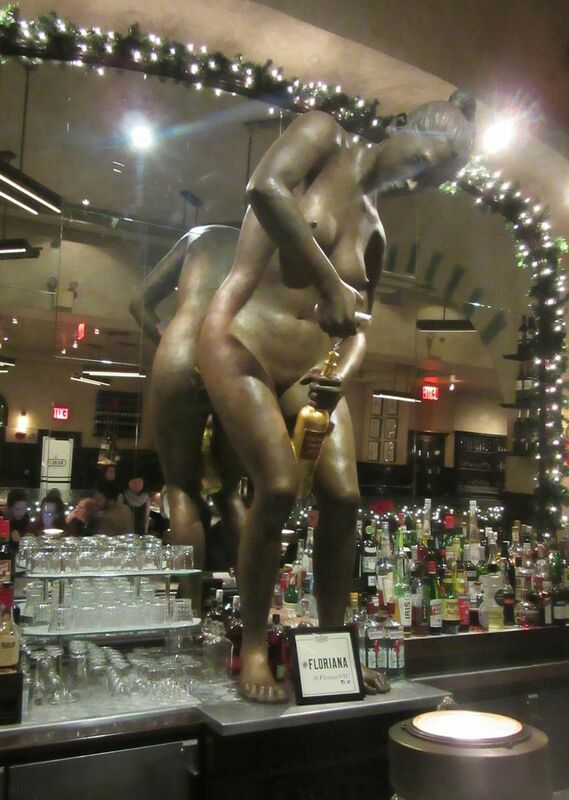 There’s another bosomy bronze on the bar. Both are his work. Now, look at the floor, an extraordinary treasure. 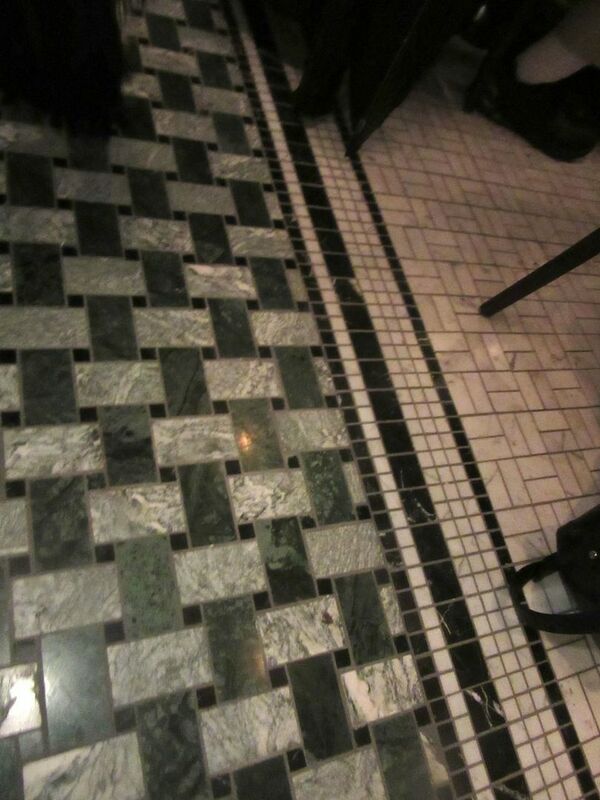 That’s carrara marble on the floor, shipped from Pietrasanta in Tuscany near Fireman’s Italian home. It’s signature Shelly Fireman, mixing a few laughs with costly custom design touches and repeating themes from his Upper West Side restaurants alongside new culinary visions. Some like the osso buco lasagna or the artichoke calzone alla giudea are so audacious that you can’t resist ordering them. 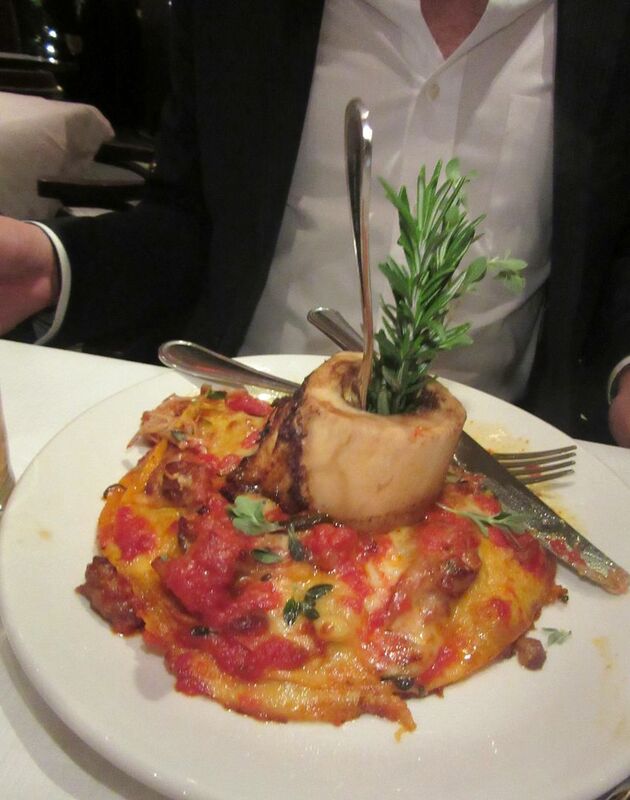 The osso buco stands like an Ionic column surrounded by very good lasagna that we’re sharing too. 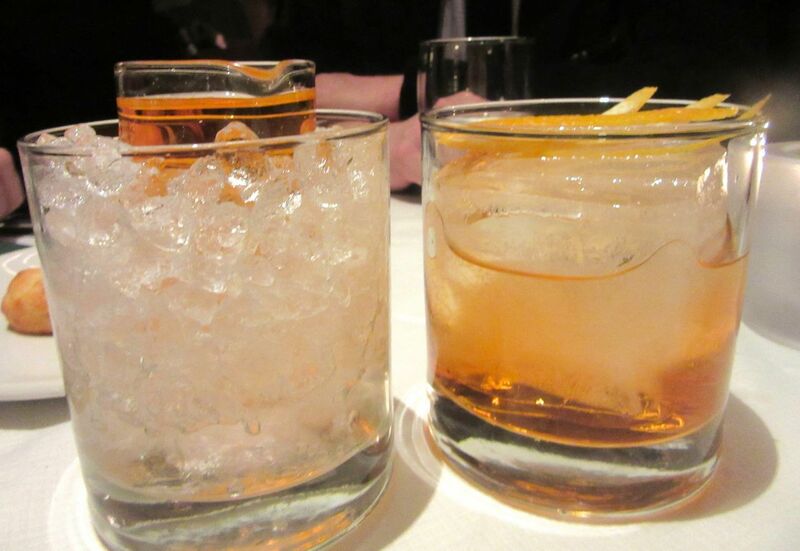 Both are striking to look at and both are remarkably delicious. The big marrowbone is like an Ionic column planted in the middle of the very good pasta. The monumental calzone is a thin half moon pizza with a pocket of spinach and scattered fried artichokes on top of a burrata sprawl. The four of us gasp and grin and are happily sharing. 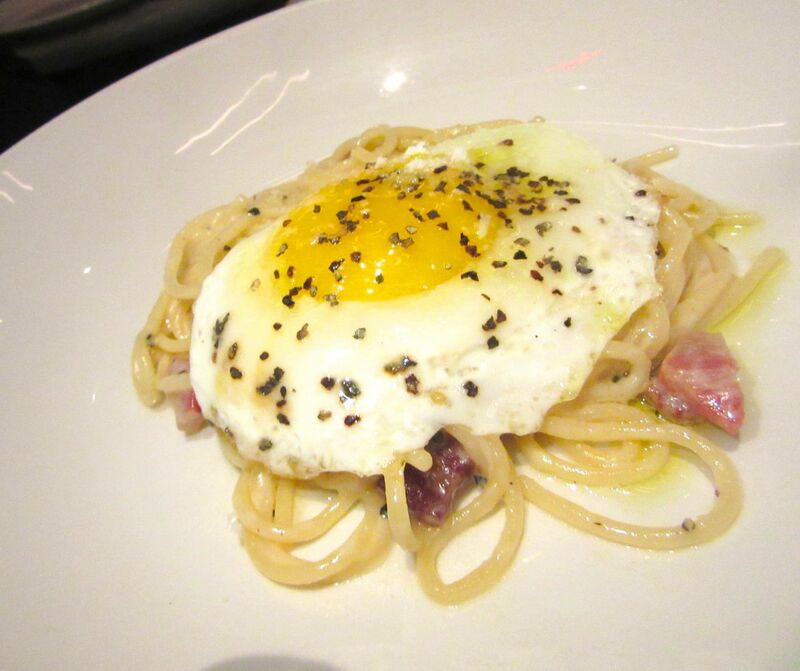 No one said Florian’s spaghetti carbonara is a faithful classic, but it’s very good. As a menu category, homemade burrata ($9.50 to $14) decked out in various whimsical ways appeals to me. Going for the wildest, burrata carbonara with a poached egg and crispy pancetta bits, I find it outright overkill. Spaghetti carbonara is equally lush and much better to eat. 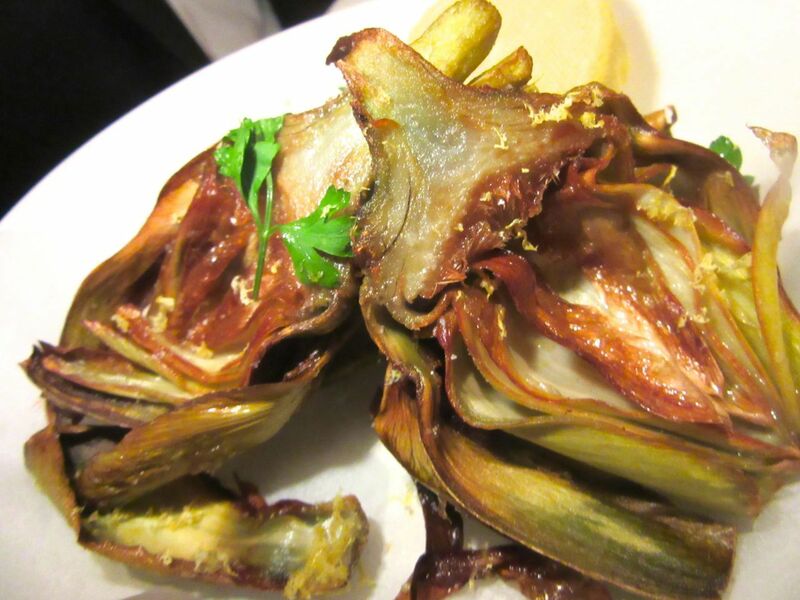 Fried artichokes are served whole, smashed open in the style of the ghetto in Rome. Braised short rib is a darkly caramelized monolith -- a bit stringy -- with house-made sausage in lush cream bramata (white corn) polenta. Nutty brown and a little greasy, there could be another artichoke in this portion. Florian is Fireman’s first venture as far south as this, unless you count his 60s Greenwich Village debut in the hospitality game, The Hip Bagel, where you might have seen the young songwriter Dylan who lived next door, or Andy Warhol with his pack, and Lenny Bruce after a performance at The Gaslight. I choose the marinated eggplant, broccoli rabe and Brussels sprouts from the antipasto display. Given his collection of flourishing outlets uptown -- Café Fiorello, two Brooklyn Diners, Trattoria del Arte, The Red-Eyed Grill, Bond 45 -- Fireman hardly needs new aggravation at this stage in his life. 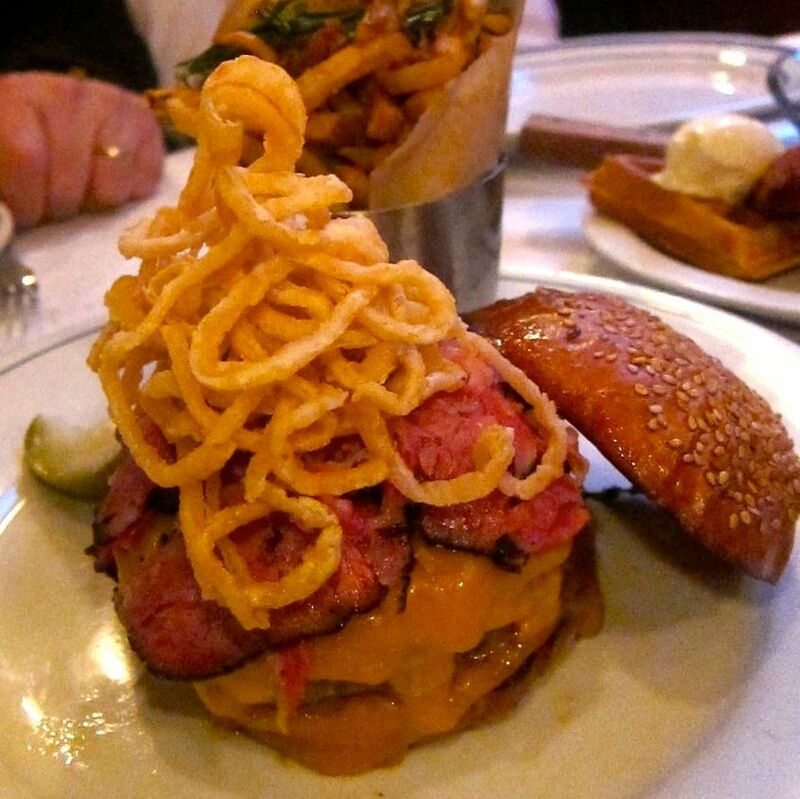 But he’s wrestled the challenge and driven his team to consider what will work in this new neighborhood around the corner from ABC Kitchen and ABC Cocina, and not that far from Gramercy Tavern. 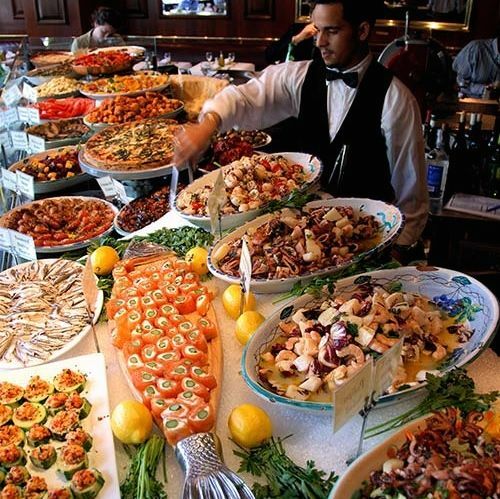 There are fewer antipasti choices than at Fiorello but they’re cheaper and our choices are delicious. 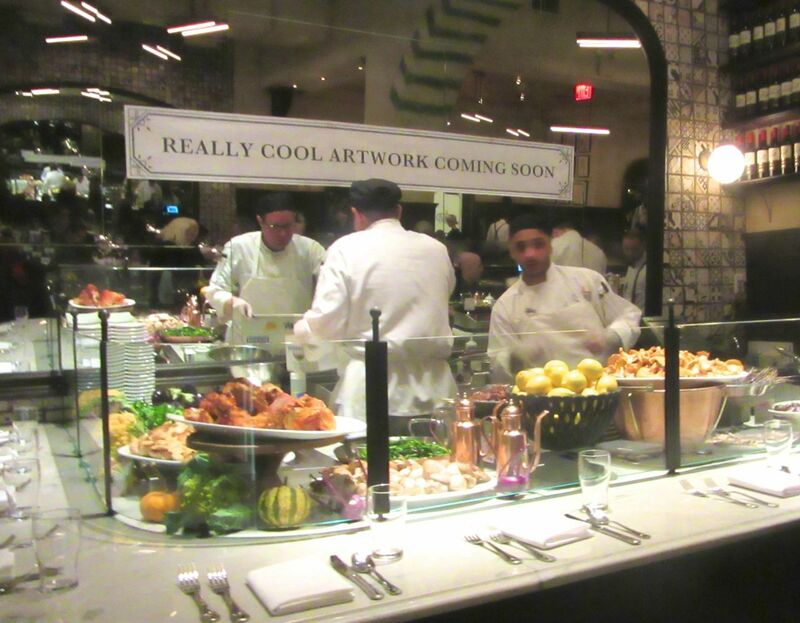 So there’s a condensed version of Fiorello’s antipasto display, a long pizza and mozzarella bar for counter eating and a restrained dessert display echoing the flamboyant dessert theater at Brooklyn Diner. There are no busboys, Waiters take your order, deliver and clear. Our striking and bosomy young Russian waitress tends to our needs like a Jewish mother. Shelly Fireman has many absorbing hobbies. Sculpture is a new one. The prices are mostly more gentle here. Pizzas start at $15. Pastas are $19 to $24. Entrees $24 to $34 for veal chop Parmigiana with burrata. 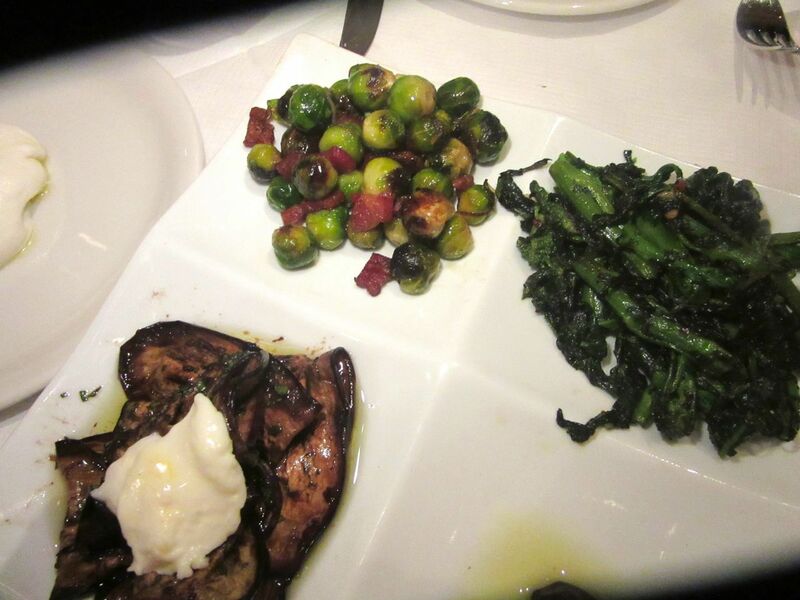 Three antipasti vegetables -- smaller portions than uptown -- are $13.95. “Homemade focaccia available on request” it says on the menu. The staff is hoping to persuade Fireman to let them offer focaccia. He’s been fighting the curse of uneaten bread for a while now. 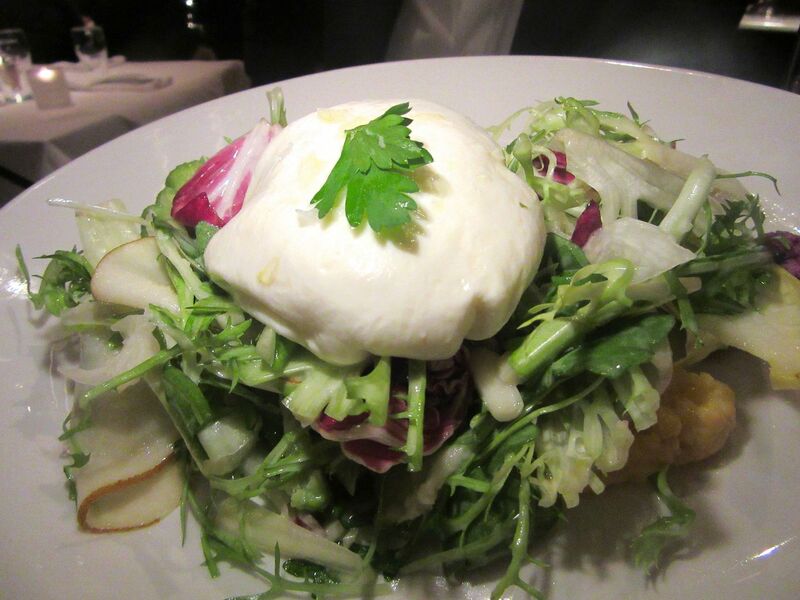 Listed as “A Very Nice Salad” on the menu, it’s more than nice, especially when topped with burrata. I probably won’t get the overwrought burrata carbonara again. 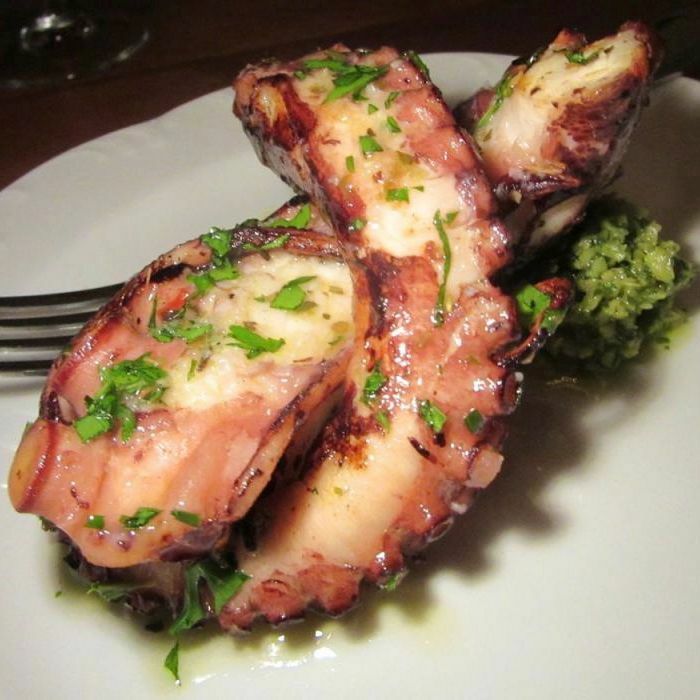 But an oozing round of it is luscious as a $7 add-on to “a very nice salad,” at $10. A modest arrangement of arugula, radicchio, puntarelle, endive, pear and apple honey dressing. I say make it $12 or $13 and bigger because it’s not merely “nice,” it’s a vibrant standout for the table to share. 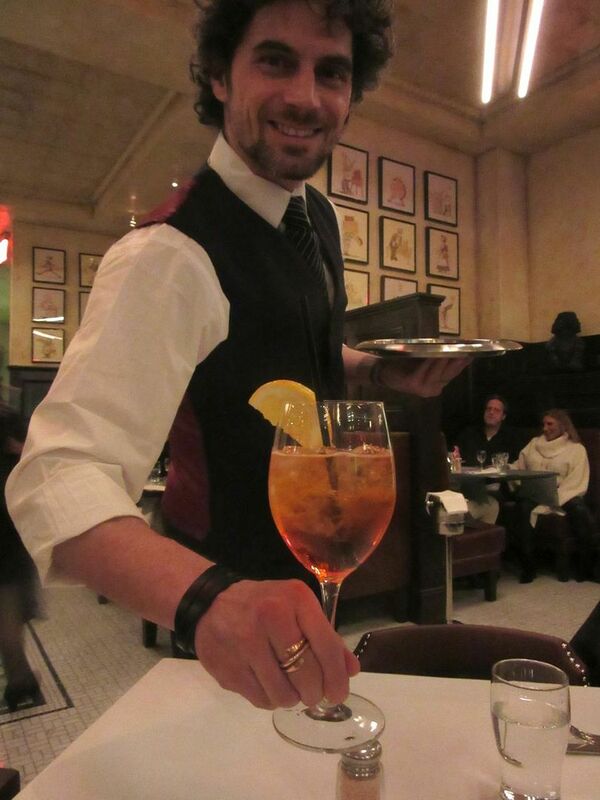 I like seeing Francesco fussing over my Venetian spritzer and indulging my friends. 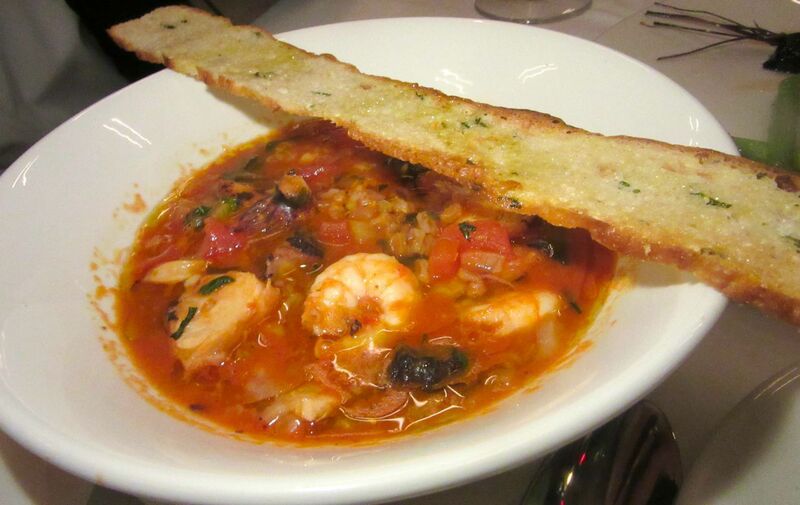 During friends and family tastings, the seafood-ferro soup was marvelous. What happened later? In the weeks between the first friends and family tastings, the opening days and our dinner tonight, Executive Chef Brando D’Olivero’s menu continues to evolve. An astonishing bowl of seafood and farro in an exquisite tomato broth that had first-responders raving at FF tastings evolved into a smaller soup portion with not enough seafood on the opening menu. But tonight it’s back as a major offering in red letters under “Pasta Fatta en Casa” -- lobster, shrimp, mussels, octopus calamari and salmon. Alas, the broth is not quite hot enough, and there’s a mound of soggy farro piled in the middle inside a moat of soup. We’ve polished off the marinated eggplant, sautéed broccoli rabe and Brussels sprouts with pancetta I chose myself from the modest antipasti lineup and we’ve demolished the calzone -- easily enough for four or five. This big chicken for two on the rotisserie turned out to be impossible to deliver with a full house. 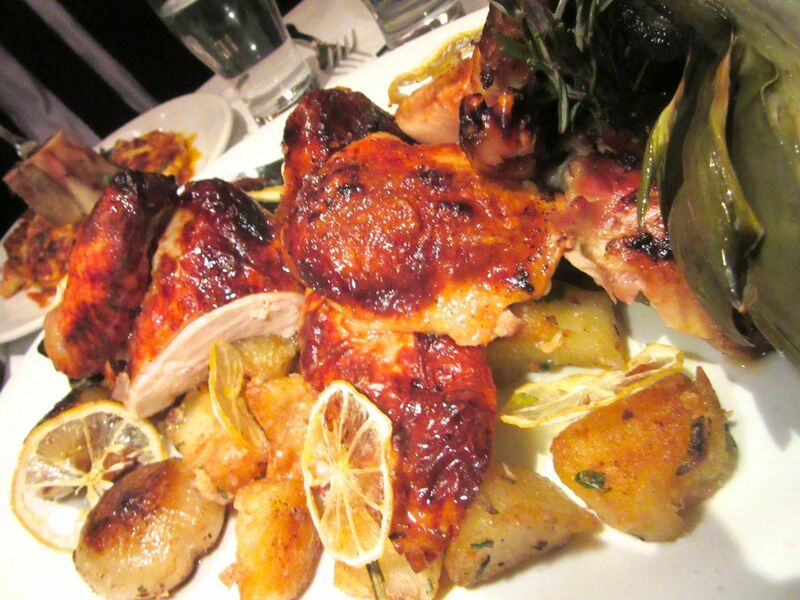 The dramatic platter of crisp-skinned chicken for two (just $58) with a whole braised artichoke, caramelized cipollini onions and crusty roasted potatoes at the opening proved to be impossible for the kitchen to turn out in the press of a full house. 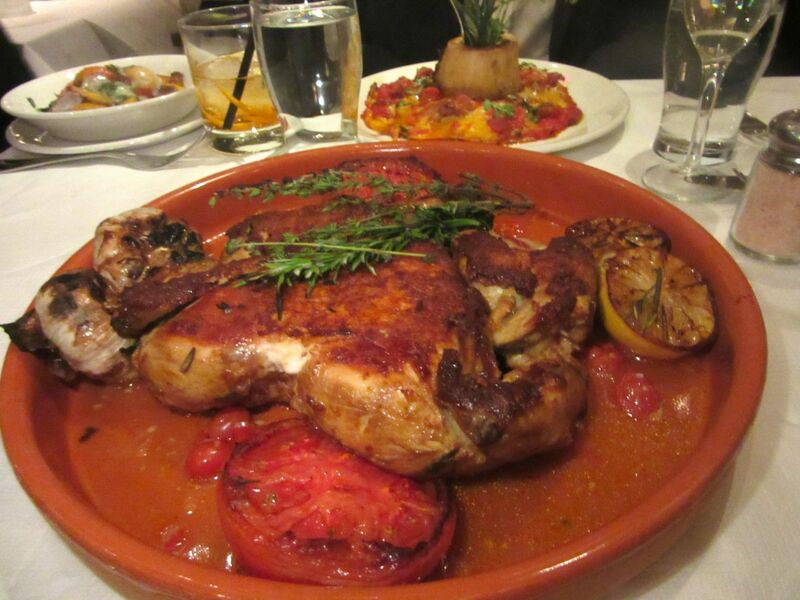 Chicken diavola cooked under a brick, available whole or half, is the compromise. It’s served with a side of homey chicken liver bits and a feisty diavola sauce. I’d probably like it more if I hadn’t feasted on its predecessor. But it seems a bit dry and the potatoes -- though still very good -- could be browner and crustier. Chicken cooked under a brick is quicker and comes with a side of chicken liver bits and diavola sauce. Dessert is never a casual afterthought in a Fireman enterprise. The lemon sorbetto at Fiorello seethes with citric pow. The satiny chocolate could not be richer. Here there was hazelnut and almond panettone for the holidays. The white chocolate caprese cake is a mellow, very sweet choice. 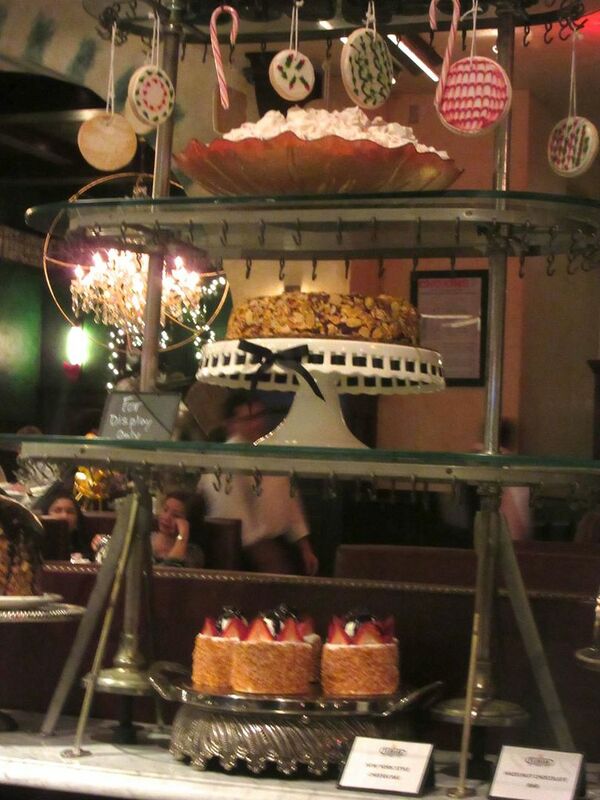 There are decorative touches scattered about including this dessert display. But I say go with the house’s visions of grandeur -- the $20 bowl of made-to-order vanilla ice cream -- three or four shockingly rich scoops, escorted by tumblers of warm chocolate sauce alongside. Dark chocolate and roasted hazelnut bark is good to share too. Or insist on the endless chocolate mousse served table-side $12 per plate. 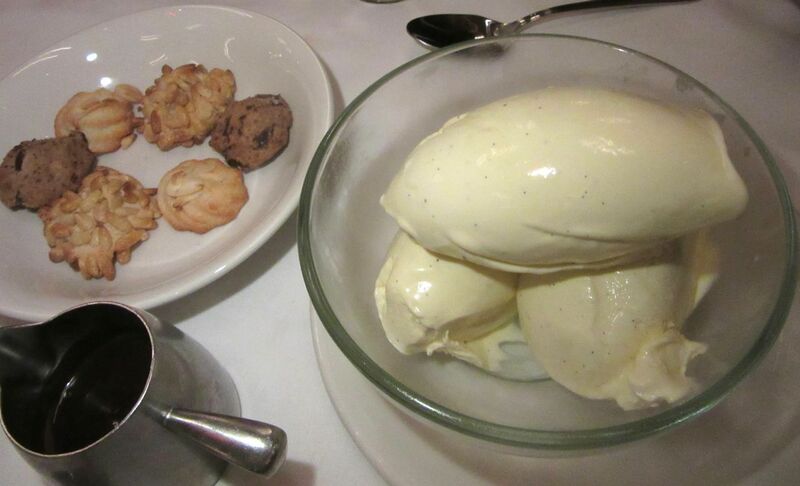 I don’t think I’ve ever tasted ice cream as insanely rich and smooth as this churned-to-order vanilla. From time to time in a Fireman restaurant, a manager will come by with chocolate chip cookies hot from the oven or little muffins with cream cheese if it’s brunch. Timing is unpredictable. But at Florian, there is always a bowl of something sweet at the door as you exit. Last time it was sugared Italian cookies -- Chiacchiere di Carnevale. 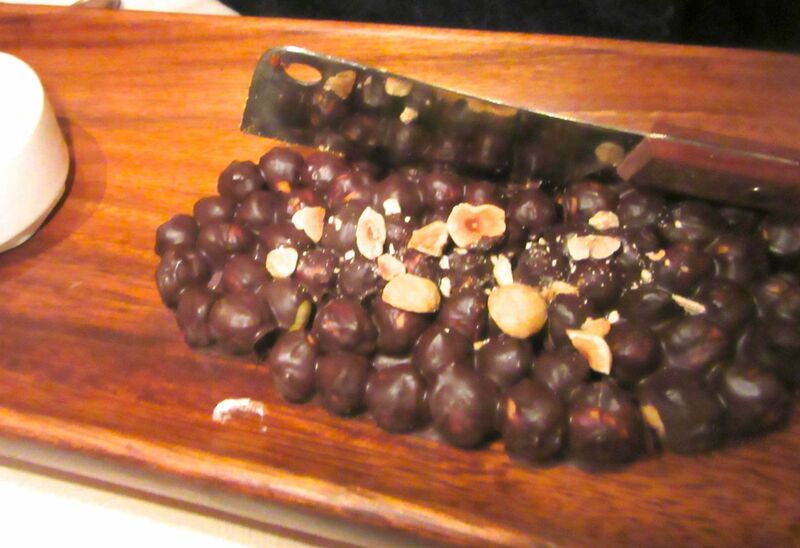 This hazelnut chocolate bark is enough for the table to share. 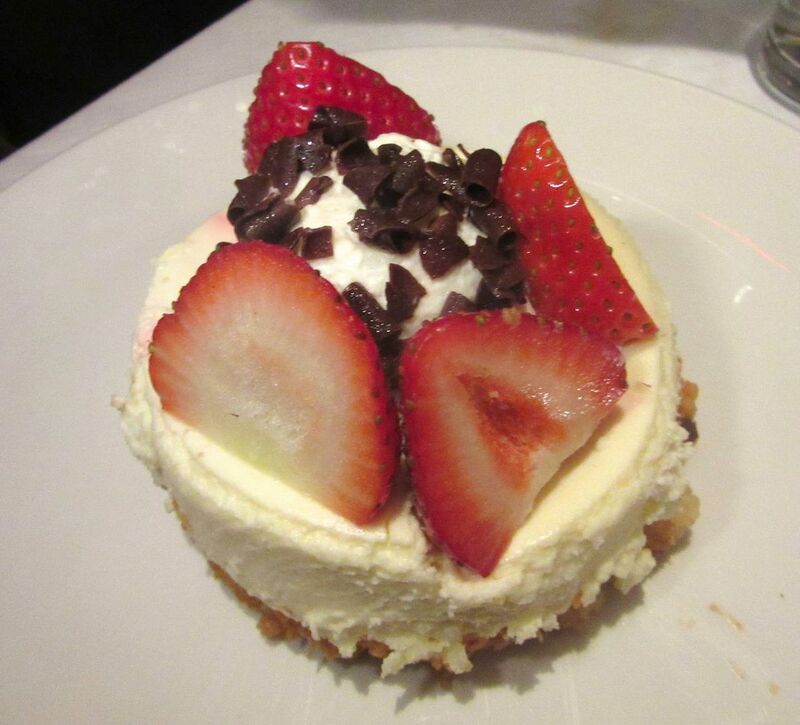 A hint of the strawberry cheesecake at Brooklyn Diner with dark chocolate along to eat with a spoon. The building stretches the entire block. It’s a vast work in progress. Florian’s menu is a work in progress, too. Meanwhile, the neighborhood is crowding in. It was most inconvenient when the Firemans couldn’t get a table for New Year’s Eve. But in another sense, Shelly Fireman didn’t exactly mind. 225 Park Avenue South between 19th and 20th Streets. 212 869 8800. Monday 11:30 am to 10:30 pm.Tuesday through Friday 11:30 am to 11:30 pm Saturday 11 am to 11:30 pm. Sunday 11 am to 10:30 pm.